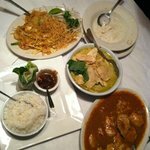 This excellent Thai restaurant is located in an old victorian hard to find house. The search is rewarded with first rate food . I don't get the rave reviews about Lemongrass. I sometimes think people think they are "wrong" or "not hip" if they give a bad review when most are raves. It's walking distance from our house so thought we'd try it for the first time. When first walking in you look straight into the kitchen, which looked awfully messy to me-things stuffed into a cart by the door, etc. And there was an odd smell, almost like an animal had lived there and the smell was still in the floor. Then the food. I ordered "thai noodles" which he called Pad Thai when he served to us. Bland and boring. I've had much better. Then, to add insult to injury, we got the bill and he told us no cards, but gee, "luckily" they had a cash machine, meaning they got an extra chunk of our money from that. NOTE: I'm happy, and expect to, pay cash at food carts. I'm also happy to pay cash if I know ahead of time. But: NO MENTION anywhere. Not on the door, not on the menus, not on the hours open sign-a person walking up has no way of knowing-in our case we could have walked home to get cash. Not nice. We will not return. Very bad vibes for us. Nice location below average food. What I expect from a good Pad Thai is flat noodles, tenderized chicken, peanuts, egg, lime wedge, green onions, bean sprouts. What I got was a white round noodle, with a mushy egg like substance mixed into it, that was overly sweet. Big chunks of chicken as if they were pulled off the chicken and just thrown in the the noodles. I think there was some green onion in it and wedge of lime. It was a lot of food for lunch $13.00 I threw away most of it... Also ordered a Thai Ice coffee $2.50 I received a very small glass.... unimpressed. I don't plan on returning. Payment is cash only. No lunch menu. Ambiance is an old Victorian House... Disappointed. I'll start with the positives; the food was very good and the woman cooking served it herself. She was very nice. I asked if it was her business and she said yes it is, for 23 years. That's it for the positives. The initial impression walking in the door is a quaint old house with period furniture. It smelled like an old house with poor ventilation. The fellow working the dining room, Dave, said it would be a few minutes even though there was only one other table with customers. The wait was only about one minute. Rather than speak to us he gestured with his finger for us to follow him. Unprofessional. He brought water and a small water pitcher to leave at the table. After we'd been there a while we noticed there was mildew on the bottom of the pitcher; clearly it hadn't been washed for some time. We ordered Thai tea and requested the milk be brought on the side. When the tea arrived the milk had been added and it was sour! It didn't look quite right but smelling it left no doubt whatsoever that it was indeed unfit for consumption. When Dave came back to take our order we point out the sour milk. His response "I just served three to that table over there and they told me they are loving it". Not cool. He reluctantly took the glasses away but promptly returned to the table with a milk carton so he could prove that it was not out of date. Again, not cool. The milk was undrinkable but he refused to accept or apologize. I was relieved that he did not return to the table with our food, the cook brought it herself and was very courteous. Good food does not make up for such poor customer service. I would not eat here again, neither would I recommend. It's too bad because the woman who owns it is a great cook and she told us a couple times to be sure and come back. Obviously she cares about her business but having someone in the dining room who does not understand good customer service is unacceptable. And clearly there needs to be more attention to detail and cleanliness. I should add, prices were higher than average for this type of food.